You desperately want to say no, but know that being too direct, even with Americans is not the right approach. Many times you have been at a loss for what to say when the client or onsite US counterpart is asking for something you know is hard to do. While at times you know it can't be done, other times, you know it can be negotiated on. How can we work to convince the US counterparts to see our side of the story? Well, it takes practice. It takes an understanding of the American mindset, and how to use your language most effectively. Even for native speakers of American English, preparation and practice is required. That is exactly why negotiation is called a communication skill. 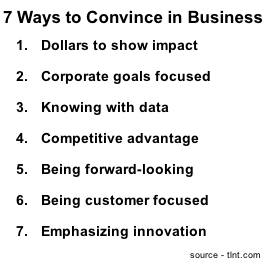 Seven key elements, noted in the graphic to the right, have been coined by tlnt.com that can be used to convince others in business discussions. While it is important to be ready to speak on all of these elements, it is not necessary to launch into a lecture on all of the elements at once. Release information strategically on one or two elements at a time, building a conversation with facts and questions. This approach brings your counterpart into a conversation. After all, you are speaking with them and not to them. Based on the project, details, and exact situation, these details may change. It's a good idea to keep on top of the information so that you are ready to talk when the time comes. While individual coaching takes a slightly different approach to these elements, I also offer a specific training that combines most of these elements into an introductory one-day program. Eremedia dot com originally posted about these four points. The original article reference is no longer available. Jennifer Kumar is a corporate coach helping Indians improve their communicative English and American culture literacy for career success. Contact her today. If they agree or NOT, THANK THEM. Tips on saying "Thank You."